So in my interview for Prose Over Pain Infertility Journal, I was asked what recipe I would make for a celebrity visiting my home. And after careful deliberation, I decided that I would have to make my eggplant parmesan. This is, hands down, my husband’s favorite recipe. It’s crunchy on the outside, soft on the inside, and a great vegetarian meal. To summarize, you peel the eggplant, slice it and lay all the slices out in one layer on some paper towels. Then sprinkle both sides of each slice lightly with kosher salt. This next part isn’t necessary, but I like to do it to hasten the process. I put more paper towels on top of the slices and then place a cookie sheet that. On the cookie sheet, I place a few soup cans to weigh the slices down. More liquid is pulled from the eggplant and with it, a lot of the bitterness that can sometimes be present. Leave the eggplant alone for at least 30 minutes. If you sliced a little thicker, let them sit a little longer. In the end, you’re left with slices that are flexible and very dry. Alton Brown also rinses the eggplant slices off after this, but since I use a little less salt, and I don’t want to introduce any more water, I just leave the slices as is. To begin, put a large pot full of water on to boil. You’ll make your spaghetti according to the directions on the box. I find that when I’m about half-way through frying the eggplant, the water is boiling and ready for the pasta. By the time the eggplant is cooked and draining on paper towels, the pasta is usually ready to drain and be placed on plates. If you like your tomato sauce nice and warm, consider putting some in a pot on the ‘simmer’ setting of a small burner while you cook your meal. Once your eggplant has been prepared with the salt and is flexible, it is ready to be dredged. Your dredging station should be set up to be used starting with your non-dominant hand and with your last dredge station closest to the stove top. I’m right handed, so I start my three stage dredging station from left to right in this order: flour, beaten egg, breadcrumbs with the breadcrumbs on the counter closest to the stove. In your left most dredging station add your flour with seasoning salt to taste. Mix together. Crack and scramble your eggs in the middle dredging station. You can add a touch of water to make the egg mixture go a little father. And finally, in the last dredging station, mix your breadcrumbs, your Italian seasoning mix (if your breadcrumbs are not already seasoned,) black pepper and grated parmesan to taste. Honestly, how much you use really depends on what you like. A cast iron skillet is perfect for pan frying, but any deep and heavy pan will do. Fill the skillet with three large fist-sized lumps of shortening. Bring the skillet to medium heat and let the shortening melt. You want the final amount of shortening in the pan to come about half-way up the side. If, after the shortening has melted, the pan isn’t half-way filled, add more shortening in tablespoon sized increments. The last thing you want is a splash over when you add your eggplant. Once the shortening has liquefied and risen in temperature, throw a small pinch of the bread crumbs into the pan. You want the shortening to sizzle, but not violently. If the shortening does not sizzle when the bread crumb is put in, raise the heat. If it’s too violent, lower the temperature. Every stove is a little different, but medium heat is a good starting point. Bring your prepared eggplant to the dredging area and take the slices through each station. Make sure to flip the slices over to get full coverage. Tap off any excess flour before moving each slice to the egg station. And press the breadcrumbs onto the eggplant before carefully transferring to the skillet. Take steps to avoid Club Hand! I can usually get four or five slices of eggplant into the skillet at one time. You don’t want to overcrowd the pan and cause the temperature of the oil to drop. So take your time and fry in small batches. In 2 minutes or so, your eggplant should be ready to flip.When both sides are GBD (golden brown and delicious) take them from the skillet and place them on a paper towel to drain some of the shortening away. Repeat until all the eggplant slices have been cooked. Since we’re not cooking a raw meat product, there are no FDA guidelines for the temperature of the eggplant. As long as they are golden and crispy, you are good in my book. By now the spaghetti should be done, so place it on a plate. Top each plate of pasta with as many slices of the eggplant as you can manage. My husband likes to pile it high. Like I said, this is one of his favorite recipes. 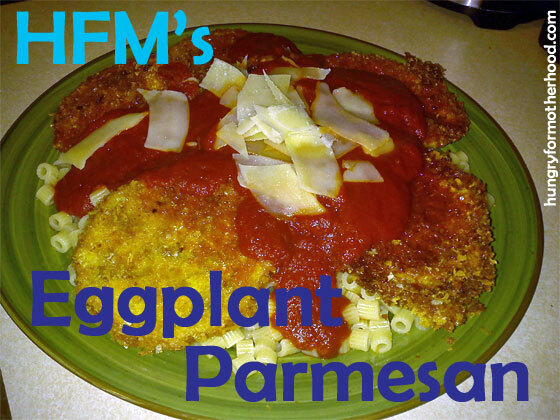 Spoon the spaghetti sauce onto the eggplant and top that with more of the parmesan cheese. Serve and enjoy. This recipe may not be low fat, but it’s delicious. I’ve served this to dinner guests, my husband, my family and I’ve always gotten rave reviews. If you decide to try it, come back and let me know how it went. What changes did you make? What did you do differently? Let me know! Ooooo, I have never tried baking it! I bet that’s delicious. Going to try that next time!! !